After-School Shrimp Fried Rice is an ideal midweek meal or hearty snack. (NAPSI)—Busy families on the go can relish simple, delicious coastal cuisine when looking for a great after-school snack or affordable dinner option. Tried-and-true family favorites such as pasta and pizza get a refreshing makeover when savory seafood like shrimp is included in semi-homemade dishes. Sensational seafood meals can be made easy with premium, frozen seafood found right in the grocery freezer aisle. Brands like SeaPak Shrimp & Seafood Co. offer an array of seafood options that make busy lives simple and delicious. With school, work, recitals, practice, games, meetings and more often all packed into the hectic week, it can be easy to let dinner fall by the wayside. The good news is that dishes using crispy, golden-brown popcorn shrimp or savory shrimp scampi can usually be prepared in less than 30 minutes. 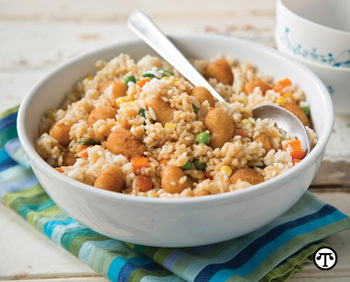 For a quick midweek meal or hearty afternoon snack, try SeaPak After School Shrimp Fried Rice. The recipe will please everyone in the family and the taste of the coast is in every bite. More mouthwatering recipes can be found at www.seapak.com. Prepare SeaPak shrimp according to package directions and keep warm. (If using Shrimp Scampi, drain half of the scampi sauce into extra bowl; use to top off dish before serving or as a dipping sauce for French bread.) Bring a large skillet or wok to a high heat and add oil. Stir in vegetables and cook, stirring continually, for 2 minutes. Stir in rice and cook, stirring continually, for another 2 minutes. Add soy sauce and stir to coat. Remove from heat and toss in shrimp. Serve hot.